Some time ago I written about the “Design by community” idea from Nokia, it was march, 6 months passed, what happened with the input from the community? 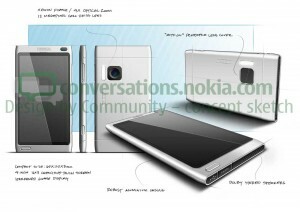 After all the steps was completed users choosen the specs and the Nokia designers made 3 sketches and asked users to vote which one will be 3D rendered. I liked the third but I have to admit after seeing the sketches again I prefer the first, the sketch 3 looks like too rounded, the second too squared :P.
Long story short a lot of people like me liked the sketch one, it was the end of july and after more than 2 months the 3D render is here (It seems machines used to render at Nokia are not so powerful :P). Yes specs, as you can see from the render the display is huge, it’s a 4″ capacitive display, screen ratio is 16:9. It’s good to see also with a so big display the phone is more compact than the HTC Desire (3.7″). Sizes are supposed to be 60 x 110 x 6-10 mm. Other specs choosen from users are: Wi-Fi, HDMI, USB 3, Surround Speakers and even kinetic power booster. Sci-Fi? Will see. The most interesting point in my opinion is the operating system, Nokia and Intel (with the community) are developing MeeGo (an OS born from the fusion of Maemo and Moblin), it’s a new OS and there is no phones on the market yet, the first should be launched before the end of the year. As you can see in the specs there is something really interesting: Multiple OS support. What does this could mean? Dual boot OS – Ugly choice, fragmentation in the same device? Please put just one OS in the phone so people will not kill themselves :P.
Leave user free to install an alternative OS – This could be really really interesting, normal user will use the pre-installed OS (e.g. MeeGo) and will live happy but advanced users will not be forced to choose if buy an Android/MeeGo/Bada/WebOS/Symbian Phone. Just choose the phone (hardware), and be free to install what do you want. This second option is in my humble opinion the future, I understand at the moment manufactures are scaried about people getting hands in this stuff but it’s sad to buy a 500€ phone and not be free to upgrade/change the software just because it’s needed to wait for the producer to update…Not considering phones abandoned to their fate just because there are newest things on the market, I understand this is progress but leave people who spent a lot of money free to install whatever they want on their phones. Returning to Nokia (sorry for the digression), it was liberal with his N900, it shipped with Maemo but you can already install MeeGo on it and in fact is one of the officially supported phones for MeeGo. So it will not be so strange if in future will see more Nokia devices on which you can install what you want. I will love to see Nokia selling good hardware with MeeGo but leave user free to use other OSs. Note, another big player on the market understood this: The Google Nexus One phone is shipped with Android but unlocked. One of the main criticism to Google about Android it the way it develops it, the new versions are developed in house and no one can see the code and/or know about the new features, it’s a Google Choice and I will not complain here. BTW I have to say, I prefer the way Intel and Nokia do the things: There are mailing lists, there are blogs where developers meet users, there is a bug tracking system and of course the code is public (there are repositories on Gitorious) and you can see and change it if you want/can (and the Gitorious “merge request” feature is wonderful in these cases). 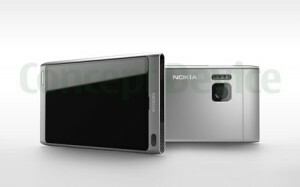 Not only this, Nokia with the “Design by Community” experiment is going far behind the software, users can also drive the design of a new phone. I don’t know if the Nokia U will be real one day, if the “Design by Community” experiment will be repeated a day, I don’t know if the future Nokia will leave users free to change OS (even Android) if they want but I know a thing: IT WILL BE GREAT, don’t you agree?